I found this one intriguing, and it made me wonder what conclusions might be gleaned from taking the data here and superimposing it on the demographic data available on a particular country, say The Sudan. Aid programs that provide women opportunities to better their health, education, and well-being have effects far beyond a single individual. 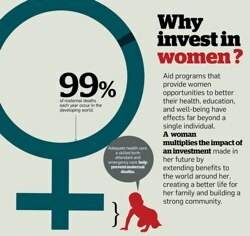 A woman multiplies the impact of an investment.